Continuing to address the question of "how do you determine the proper trim-to length?" 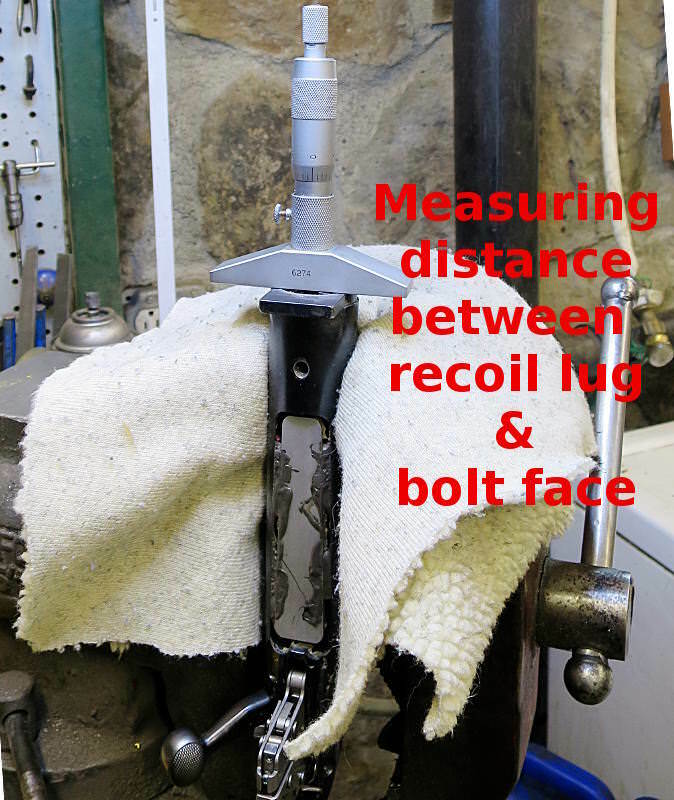 First, let's measure the distance between the recoil lug and the bolt face. On this action it was 0.886". My standard tenon length is 0.880" but on this Shilen barrel it ended up 0.879". Subtracting 0.879" from 0.886" leaves 0.007" clearance between the bolt face and the end of the barrel except that the receiver and the barrel shoulder may "give" a little bit when the barrel is screwed on tight, so that reality there may be less than 0.007" clearance. 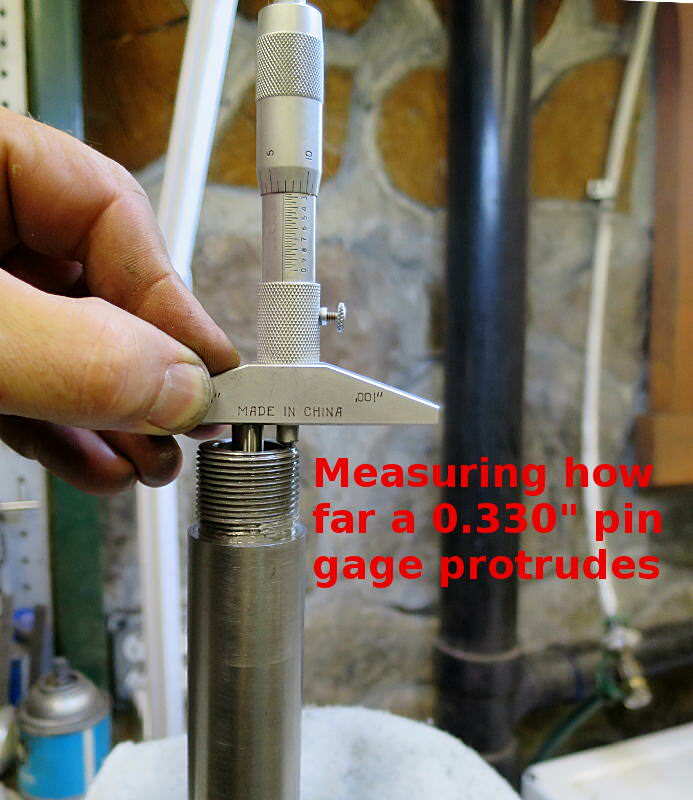 The chamber neck is 0.331" - 0.332" diameter so I dropped a 0.330" pin into the chamber and measured how far the pin protruded from the barrel. The pin was 1.999" long and it protruded 0.248" from the end of the barrel. Subtracting 0.248" from 1.999" leaves 1.751" between the end of the barrel and the end of the chamber neck. Add the 0.007" bolt face clearance to 1.751" and we end up with a max case length of 1.758". So in theory my 1.747" long cases should fit with 0.011" to spare -- perfect! But .... remember that the receiver and the barrel shoulder may "crush" a little bit when screwed together, so that the actual clearance may be less than our calculated clearance. If these measurements say that my 1.747" long cases should fit OK, then why did the 1.745" long dummy case seem to jam against the throat when viewed with a bore scope? Well, the dummy case was a sized case. If, for the sake of argument, you size a case so that the shoulder is bumped back 0.020", that makes the neck 0.020" longer, and allows the case neck to enter the chamber neck 0.020" deeper. If I am going to use a dummy case to check the case length, then I should use a fired dummy case, not a sized dummy case. Now that I've done all these measurements, I no longer see any need to cut the chamber neck longer. Perhaps I'll trim the cases a little shorter, say to 1.740", just to be safe, and perhaps I'll adjust my sizing die so that it barely kisses the case shoulder, but I no longer view the case length as a smoking gun that could have caused this morning's bad accuracy. So what did cause the bad accuracy? I've been trying to figure out why accuracy went South on this barrel. It started out decent, then something changed. if I remember correctly, the decent groups were fired with virgin cases, then accuracy went South about the time I switched to fired-and-sized cases. My memory is unreliable these days, so I could be mistaken, but nonetheless I don't have any better theories at the moment. Why might virgin brass be more accurate than fired-and-resized brass? 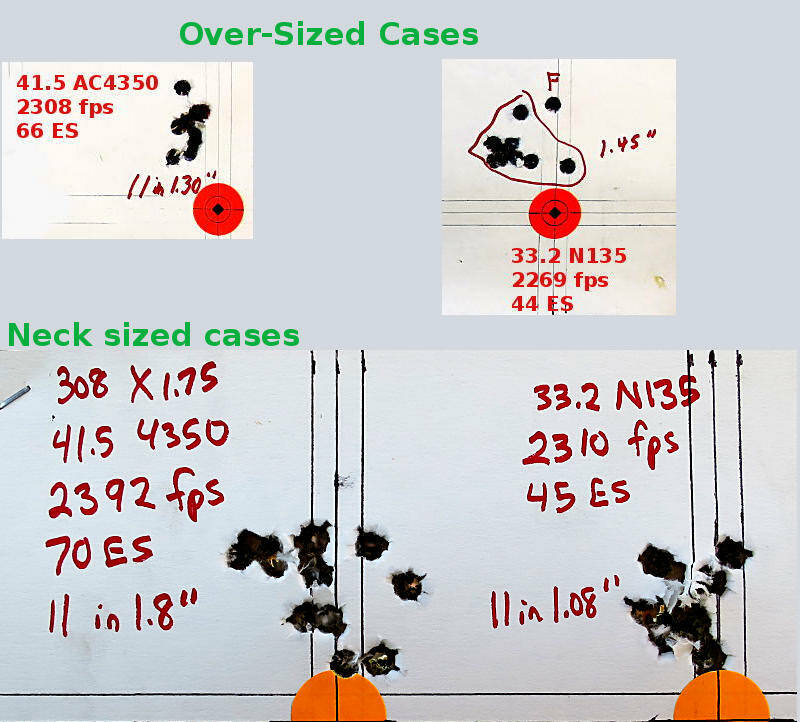 What if the fired cases were sized too much, similar to the dummy case that I used to visually check case length? Over-sizing the case could cause 2 problems 1) lengthen the neck and allow the neck to jam into the throat, similar to the dummy case and 2) create excessive headspace that absorbs the impact of the firing pin and weakens ignition. With the barrel off, I dropped a sized case into the chamber, pushing it in with moderate finger pressure. 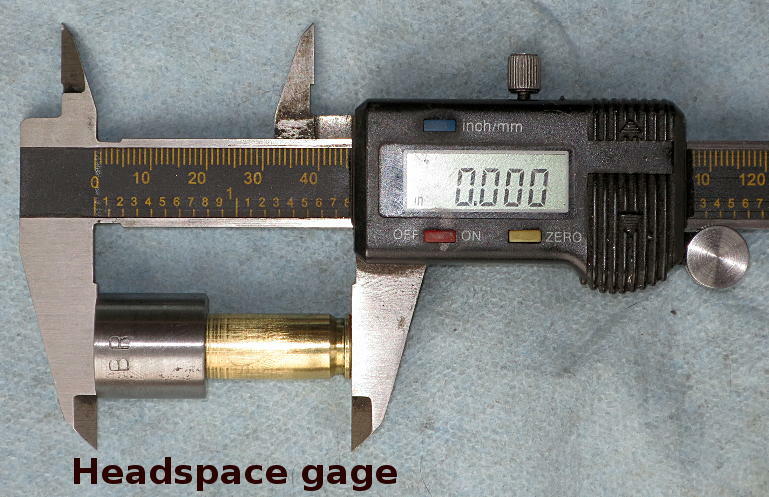 The sized cases stopped 0.006" below the end of the barrel. By comparison, fired cases stopped 0.001" below the end of the barrel. In theory, a fully fire-formed case should protrude 0.007" from the barrel, based on the receiver and tenon measurements in the previous post, but these moderate pressure loads may not have fully fire-formed the case. Also, the receiver and the tenon shoulder may "crush" a bit when the barrel is torqued into the action so that the actual protrusion could be less than the calculated 0.007". I'll re-adjust my sizing die for minimum sizing and re-test accuracy. I'm skeptical that a minor change in the sizing die setting would have a big impact on accuracy, but at least I can rule it out. Also, this Remington bolt still has the original 1970's vintage striker spring, so it may have taken a set and need to be replaced. 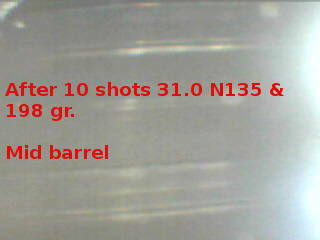 -- sized cases then protruded 0.0055" from the end of the barrel, pretty close to the calculated 0.007" ideal. -- I changed the case trim-to length from 1.747" to 1.745"
After thinking about it some more, I doubt if the excessively-sized cases had been jamming into the throat hard enough to distort the bullet, because that would require force and no such force would be pushing on the case. Worst case, the excessively-sized case would have butted up against the throat entrance similar to a 45acp round. The main problem with the excessively-sized cases would be excess headspace leading to weak ignition. With the changes made to the cases, I re-tested two of the same loads that I tested previously. Here are the before-and-after targets. Velocity increased 84 fps with the AC4350 load and 41 fps with the N135 load, reinforcing the theory that ignition had been weak with the excessively-sized cases. Accuracy was worse with the AC4350 load, but better with the N135 load. As always, one bad group is enough to prove that a load is bad, but one good group is not enough to prove that a load is good, so I want to repeat the N135 results at least one more time before I declare a victory. I'm going to give up on AC4350 because it just doesn't burn well enough at these moderate pressures (44,000 psi). IMR4350 seemed to burn a little better, but I am nearly out of IMR4350. Quickload has not been predicting velocities accurately with this particular lot of N135. QL predicted 2174 fps and 36,000 psi with today's 33.2 gr. charge, but today it actually produced 2310 fps. Since the relationship between velocity and pressure is fairly reliable, I would estimate that today's load generated 44,000 psi. That may be too much pressure for optimum accuracy, but I'll worry about that later. -- see if the N135 accuracy is repeatable now that the case sizing issue has been sorted out. 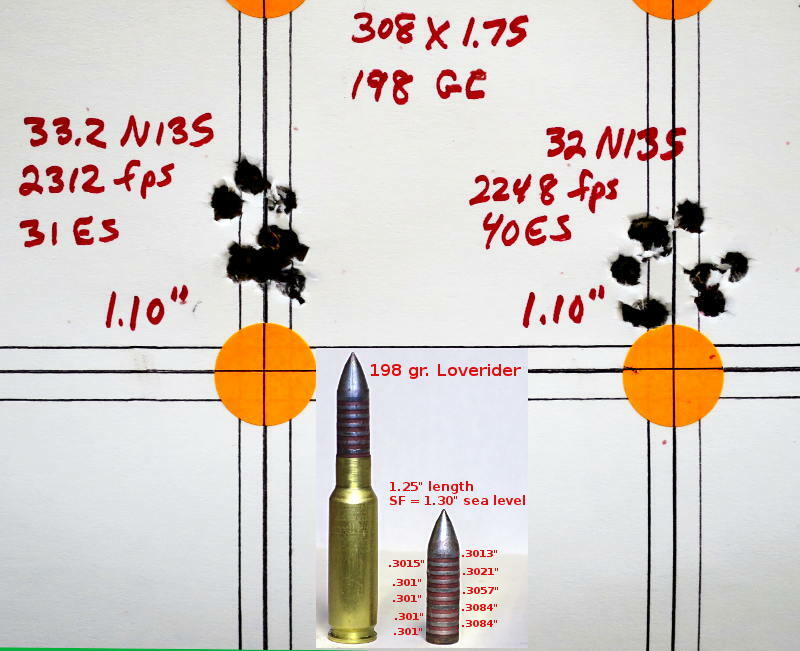 -- if N135 can average 1 MOA at 2300 fps, then that will become my control load and I want to move on to testing bullet designs. -- I may need to lower velocity & pressure if I want to do better than 1 MOA, but that can wait. -- since 33.2 gr. N135 occupies only 93% of the available powder space, it might be worth trying the thicker Lake City cases. But first let's see if the N135 accuracy is repeatable. Re-testing the 33.2 gr. N135 load to verify that its 1 MOA accuracy is repeatable. While I was at it, I threw a couple of different primers into the mix. The target speaks for itself. Neither the WLRM nor the CCI 300 are likely choices for this application, but they were the only other large primers I had on the shelf besides the Fed 210 that I normally use. The good news is that the 1 MOA accuracy does seem to be repeatable since I fixed the case sizing issue. One MOA will not win matches, but it won't get laughed at, either, and it will suffice for testing different bullet designs, which was always the main purpose of this project. I don't trust Quickload's predictions for N135 -- they're not even close to real life, so to estimate the pressure of my N135 load I used powders with burning rates similar to N135. 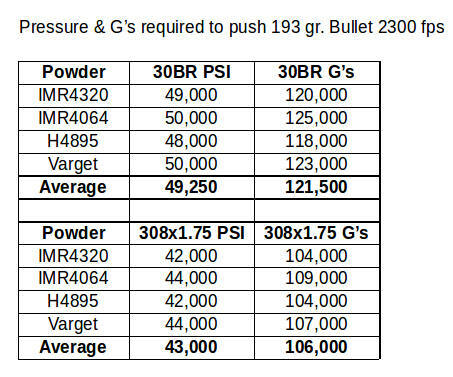 The table below shows the pressure and acceleration required to push the 193 gr. bullet to 2300 fps from a 25.5" barrel. Unless it defies the laws of physics, N135 should generate similar pressures and accelerations. -- switching to 308x1.75 dropped the average pressure 6,250 psi, a 13% reduction. -- switching to 308x1.75 dropped the average acceleration 15,500 G, a 13% reduction. 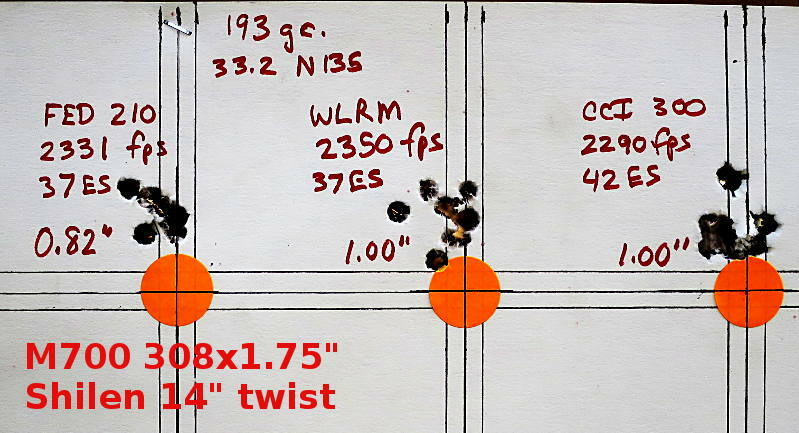 -- switching to 308x1.75 allowed the use of a 6% heavier bullet at the same velocity and same accuracy. So yes, the 308x1.75 seems to be an improvement over the 30BR, but admittedly it was a lot of extra work for a small gain. As I keep pointing out, all the easy gains in benchrest were found a long time ago, what remains is jumping through hoops for itty bitty gains. There are still load tweaks that could be done and should be done to improve accuracy. At an estimated 43,000 psi, this 2300 fps load is probably still too warm for optimal accuracy compared to the average 36,000 psi load used by top CBA competitors. Nonetheless I need to switch gears for a while and focus instead on testing bullet designs. Re-testing a couple of experimental bullet designs. I already tested these in the 30BR and they performed poorly, however that was when the 30BR was struggling with carbon fouling issues that may have confounded the results. So I gave these two bullets another chance to redeem themselves. All of today's loads were seated right at the jam point. The jam point can be varied by varying the nose sizing depth. I tried the CLR bullet with two different seating depths. 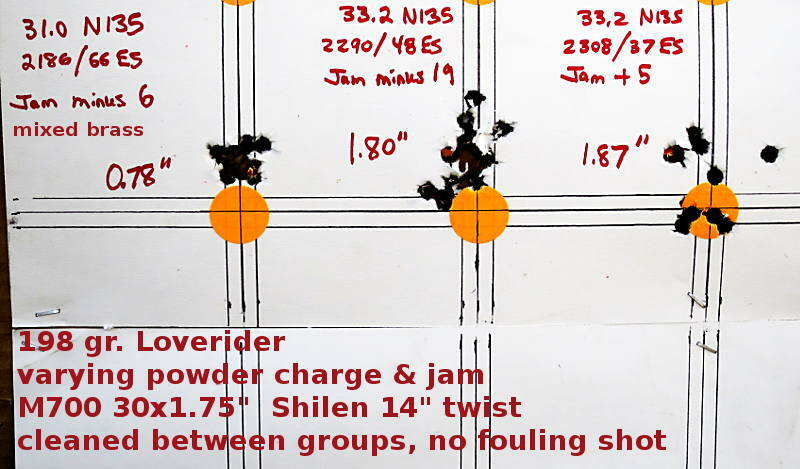 In general, seating deeper helps the powder burn better because the neck grips more of the bullet, but seating further out tends to be more accurate *if* you can get the powder to burn satisfactorily. The 197 gr. smooth nose is the same design as the 193 gr. Loverider control bullet, other than the nose was re-cut to be smooth. The target speaks for itself -- the two experimental bullets still did not shoot satisfactorily. The deep-seated CLR had worse accuracy than the long-seated CLR. I've never had great luck with smooth nose bullets, so no surprise there. However, I have no logical explanation for the CLR's poor accuracy. Today I tried seating the 193 gr. Loverider further out. Normally I seat it 0.255" deep, but today it was seated 0.155" deep. 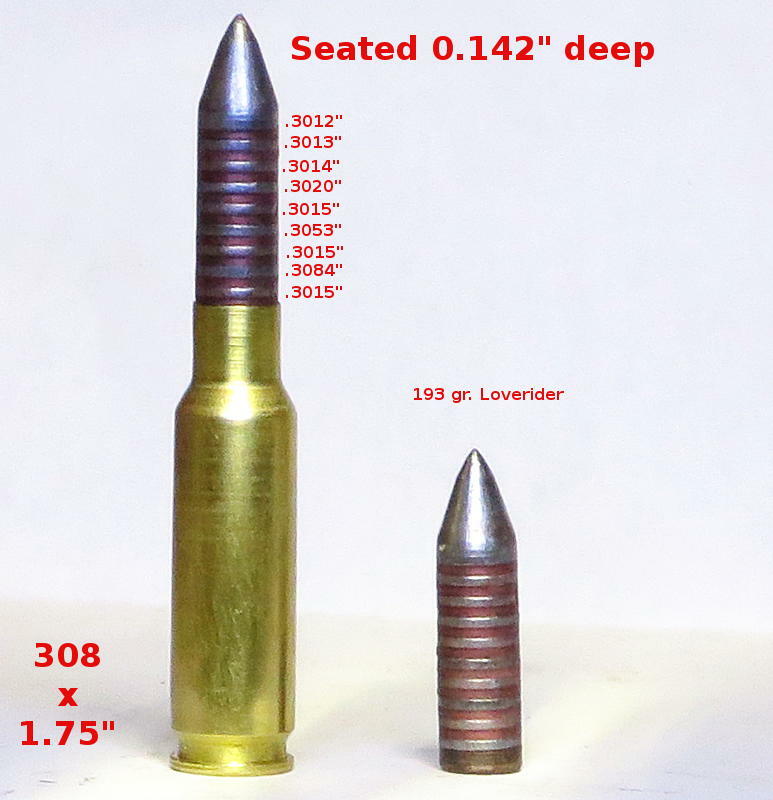 This was accomplished by adjusting the nose sizing die so that the bullet would jam the rifling at that seating depth. In general, seating out further improves the initial alignment. The downside is that it weakens the cases grip on the bullet, which may result in more velocity variation. In this particular case, the increased nose sizing essentially turned the bullet into a bore-riding nose, with the weakness that goes along with a bore riding nose -- a tendency to "tip" in the barrel if pushed too hard. The good news is that the ES was not harmed and was in fact pretty good. The bad news is that accuracy was 1.25", compared to 1.00" for the control load. I will stick with the control load's 0.255" deep seating depth. Behind the bench at 5:30 a.m. to test a new bullet, a 198 gr. Loverider. Even at 5:30 a.m. there was a bit of boiling mirage, and the light was dim and hazy due to smoke from wildfires. I could not discern the scope crosshairs and had to settle for centering the 1/8" dot against the orange target dot (which was dancing due to the mirage ). I felt like the range conditions were sometimes limiting accuracy, but oh well that's part of the game. At 1.25" long, this bullet would be maxxed out at sea level in the 14" twist, with a Miller stability factor = 1.3. 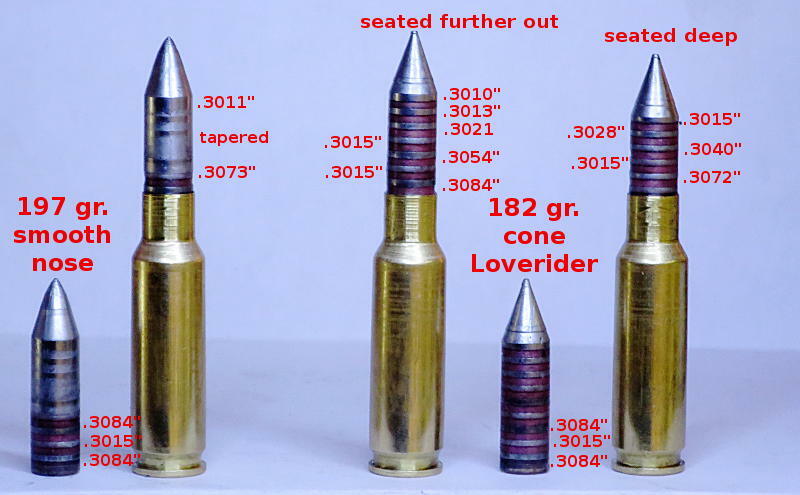 The longer bullet allowed me to squeeze in one more band at the bottom of the bullet, and the question was should it be a bore riding band or a groove diameter band? I could not make up my mind so for now it is a 0.301" bore riding band. After I finish testing this version then I'll recut that bottom band to be a groove diameter band and re-test, to see which version it prefers. After my recent incident with accuracy going down the toilet due to over-sizing the case, I figured there had to be a better way to dial in the case sizing die, and sure 'nuff, there is. They're called case gages, and you can buy them from Hornady or from L.E. Wilson. But since I am frugal, I made my own by boring out a little piece of scrap metal. Stick a fired case in the gage, zero your calipers on it, and that's your reference point. Now adjust the case sizing die until a sized case has the same headspace, or in the case of a hunting rifle, perhaps a couple thou less headspace. For years I adjusted the case sizing die by trial and error, sizing just enough to ensure reliable chambering. However, the trial and error method depends on "feel" and is subject to human error, as I learned the hard way. More tests of the 198 gr. Loverider, with tweaks to the powder charge and to the amount of jam. The 31.0 gr. load used mixed brass -- some Remington, some Winchester, some virgin cases, and some cases that had been over-sized and had too much headspace. Yet it shot OK despite a 66 ES. The 33.2 gr. loads were so lousy today that I wonder if there was some other problem, besides varying the jam? By comparison, yesterday's 1.1" groups had minus 13 jam. I did clean the barrel between groups, but due to being in a hurry it was a minimalist cleaning with a nylon brush followed by one wet patch and one dry patch, and I didn't check with a borescope to verify that all the carbon fouling was removed. Unless I find a smoking gun to blame for the 33.2 gr. 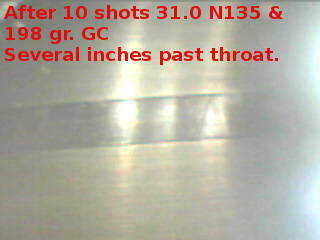 load's poor performance today, I'm going to say that the 198 gr. bullet does not shoot as well as the 193 gr. bullet with the 33.2 gr. load. That's not surprising because the heavier bullet generates more pressure. 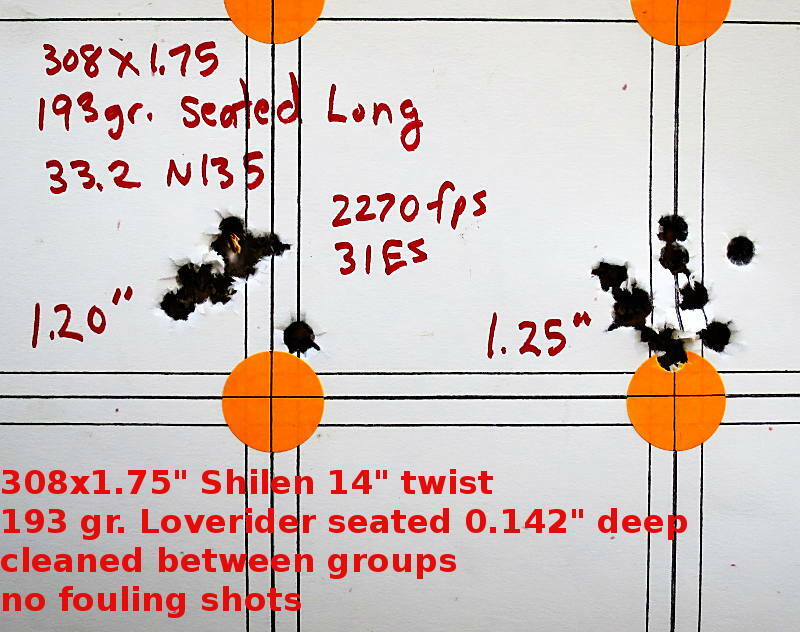 That's why I experimented with lesser charges (alternatively, it might be possible to find good accuracy with the 33.2 gr. load if I tweak the bullet design or bullet alloy to better withstand high pressure). The 31.0 gr. load showed potential, but I need to retest it to see if it is repeatable, and also to fine tune its jam setting. Re-testing the 31.0 gr. N135 load with the 198 gr. Loverider, and also tweaking jam. Range conditions were good for the "Jam minus 10" group," but boiling mirage kicked in for shots 3 - 10 of the "Jam minus 5" group. I had planned to shoot a "Jam minus 0" group but will reschedule when there is no mirage. Unfortunately, mirage-free minutes seem to be rare on my range. I feel that today's "Jam minus 5" group was compromised by mirage so I plan to retest it before I draw any conclusions.